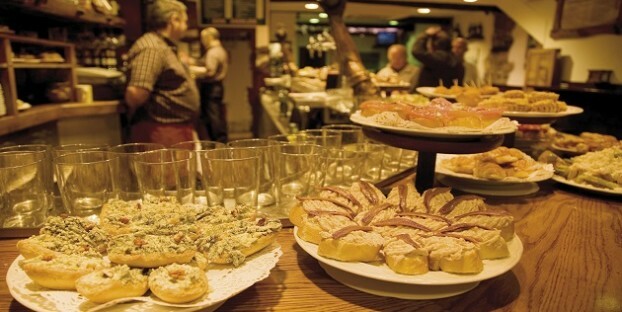 The food of Northern Spain is some of the best in the world! The incredible local produce from mountains, land and sea, and the talented chefs hosting at the mind-boggling selection of Michelin starred restaurants in the regions of Cantabria and the Basque Country make this a wonderful holiday destination for food lovers. The stretch of the Bay of Biscay between Santander and San Sebastian boasts over thirty restaurants that have been awarded Michelin stars, including four with the top three-star rating. Book a table at any one of these venues for an unforgettable gastronomic experience! The geography of the region has undoubtedly been an important factor in shaping the food culture here; keen cooks are spoilt for choice with an amazing array of seafood, top quality farmed meat and wild game, pulses, fruit and vegetables and delicious pastries. Seafood is a particular speciality with the freshest fish and shellfish arriving daily to the markets and restaurants. You’ll find the best clams, razor clams, mussels, lobster and squid as well as sea bass, hake, sardines, tuna, and less well known delicacies like baby eels and the prized goose barnacles known locally as percebes. Salt cod is also very important in the region with Vizcaya known as the ‘Capital of Bacalao’ and tasty salt cod croquettes are a favourite tapas dish. Veal is widely used with Cantabria famed for the Tudanca cattle that are raised here. Pork is popular too and is a key ingredient in the bean stews that form the food heritage of the mountains. Wild game including deer, quail, partridge and boar are also on the menu giving an extra dimension to the meat selection on offer. Spanish pastries are often based on a dough that is a cross between a light cake and puff pastry with the crumbly, buttery layers formed and flavoured differently depending on the location. Look out for crisp ‘bowties’ in their distinctive shape sprinkled with powdered sugar, twisted ‘Sacristanes’ drenched in sugar and flaked almonds and rectangular iced ‘Polkas’. Other sweet treats include Cantabria’s most famous dessert; a baked custard flavoured with lemon and cinnamon called Quesada Pasiega. The cheeses on offer include the renowned Cantabrian cream cheese that has a PDO meaning it can only be made in this region. There are also blue cheeses like the piquant Picon Bejes-Treviso and fragrant smoked cheeses like Aliva and Pido. With such a wealth of top quality ingredients it’s no surprise that this was the place where the fine dining of today has its roots. In 1975 a culinary movement began with inspired, talented and passionate Spanish chefs creating new and innovative ways to cook and eat. ‘Molecular gastronomy’ was born and the combination of this new approach to food, together with the rich food culture and resources of the region, ensured the success of groundbreaking new restaurants like Arzak, Aklelare and Martin Berasategui in San Sebastian, and Azurmendi in Bilbao, all of which hold the highest culinary accolade of three Michelin stars. Try the tapas. Tapas is a great way to try a little of everything! Most bars serve a huge variety of tasty mini-plates so you can step outside your comfort zone and order some wonderful food you’ve never tried before. Every bar has its own specialities so make yours a ‘walking supper’ as you take in a few different venues to try their recommended dishes. It’s the best way to spend a balmy Spanish evening with friends or the one you love. Go to market. The food markets are incredible in this region so even if you are not buying you must go and enjoy the spectacle of beautiful stalls laded with exceptional local produce. If you are self-catering it’s the perfect place to pick up stiff-fresh sardines for the BBQ or a bag of clams or mussels to steam with wine and toss in salsa verde. Book a Michelin starred meal. It is an extravagance, but for a magical evening that’s much more than ‘just’ food these restaurants really are worth it. The art, theatre and alchemy will surprise and delight and it will be an evening you’ll never forget! Get off the beaten track. Try and find time to visit an out-of-the-way restaurant in the mountains or foothills where you can get an authentic taste of ‘old Spain’ with a hearty bowl of pork and bean stew. ‘Mountain stew’ can also include potatoes, locally made blood sausage and cabbage. The intense, earthy flavours are something you won’t find anywhere else. Take the flavours home. Don’t miss the opportunity to bring home the delicious flavours of Northern Spain with some tasty souvenirs! Hard cheeses, preserved meats and sausages, tins of anchovies and jars of bean stew are all great choices. Brittany Ferries travel to Santander and Bilbao delivering you to the heart of the region and we offer 20% discount on your fares when you book accommodation with us. If you are thinking of taking a trip why not stay at this charming house in Cantabria or browse our properties just across the border in the Pyrenees Atlantiques region of France to find the perfect place to stay? Brittany – Top 5 recommendations in a foodie paradise!